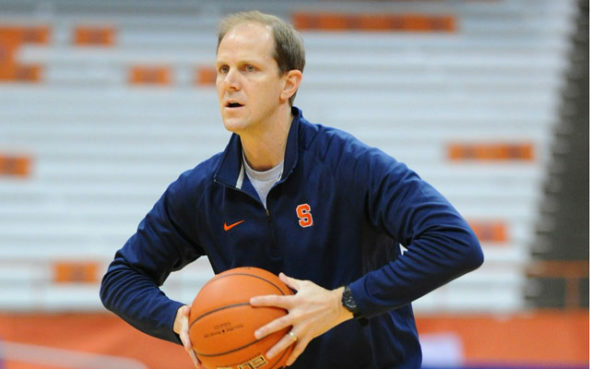 Mike Hopkins needs four wins in seven games to become the most successful first-year head coach in University of Washington basketball history. Post-Edmundson, an Idaho native who competed in the 1912 Summer Olympics in Stockholm as a middle-distance runner, the Huskies have appeared in 15 NCAA tournaments, or one about every five years (their current streak of missing the Dance stands at seven years). After winning the PCC championship and reaching the Final Four in 1953 with NCAA Player of the Year Bob Houbregs, UW didn’t win another conference crown until 2009 with Brandon Roy. The majority of the intervening 56 years were mainly meh. Such a paucity of bragging rights makes the Mike Hopkins story stick out like 5-foot-9 Nate Robinson dunking on and blocking 7-6 Yao Ming, events more than a decade old now but so astonishing that they can still be seen on YouTube videos. Hopkins, who succeeded Romar in March after the Huskies finished the worst year ever under his tutelage at 9-22, has guided the Huskies to a 17-7 record. UW has seven games left before the Pac-12 tournament March 7 in Las Vegas, starting with a 7 p.m. (ESPNU) contest Saturday night in Corvallis against Oregon State. If UW can win three of the seven (it already has wins over two of the seven remaining foes, Cal and Colorado), four of which are at home, Hopkins will be the fourth UW head coach to finish with 20-plus wins in his first season on the job. Art McLarney did it in 1947-48 by going 23-11 after taking over for Edmundson, who retired. McLarney not only won the PCC title in his first year, the Huskies came within a game of reaching the Final Four. Tippy Dye replaced McLarney in 1950-51 and went 24-6 in his first season, including two wins in the NCAA Tournament. Two decades elapsed before anothe head coach won 20 in his first year. Harshman did it in 1971-72, going 20-6. The first is a list of first-year UW coaches who orchestrated the greatest one-year turnarounds in school history (and where Hopkins currently ranks) and is based on the greatest improvement in wins above the final year of their predecessors. Hopkins needs three victories to tie and four to eclipse Edmundson. He went 18-4 in his first year (1920-21) after replacing Stub Allison, who finished 7-8 in 1919-20 (Plus=Wins over previous season), an 11-game swing. The second list identifies those head coaches who posted a worse first-year record than the head coaches they replaced. All but John Grayson (57-49) and Romar (298-195) finished their UW careers with losing marks, and only Romar made the NCAA Tournament (Minus=Losses over previous season). Perhaps most impressive of all is that Hopkins also needs three wins to become the fourth head coach in conference history — this dates to 1916 — to win 20 games following a 20-loss season (see the list here). Whether Hopkins reaches 20 wins, whether the Huskies make the NCAA Tournament, he has already exceeded every hoops hope every UW fan had when he dropped his bag in Montlake. After Romar’s disastrous last year , after we lose an amazing recruiting class with the exception of Nowell , no one could’ve ever dreamed they’d be this good year one under Hopkins . And he’d never been a head coach before . Honestly , I was hoping they might win 12 before the season started . The player’s buy-in on the 2-3 zone has been remarkable year one . Hopkins is putting together a solid resume for Coach of the Year . Well, not quite the bounce, but it doesn’t change your point about single-season recovery. No one but Hopkins saw the upside.